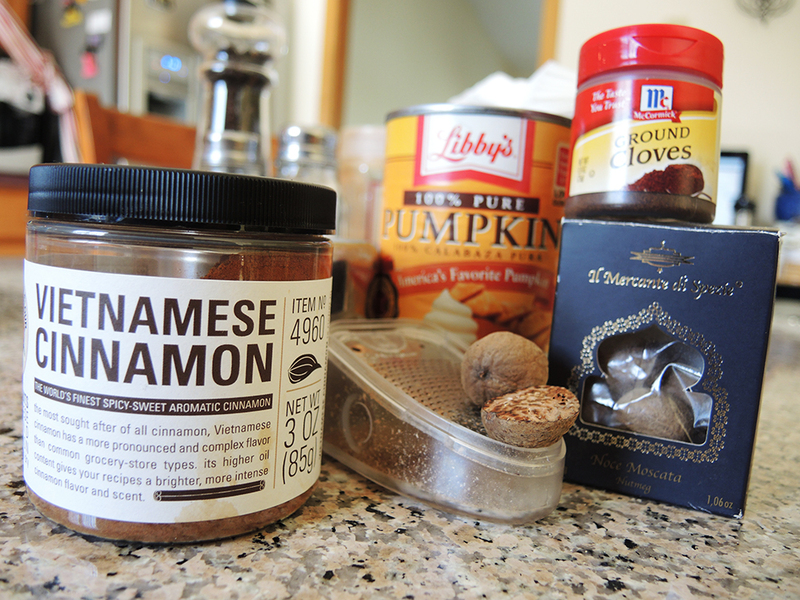 Whenever fall rolls around the need for pumpkin and pie spices takes over the general populace. Many of us rush over to our favorite coffee shop to spend an absurd amount of money for a Pumpkin Spice Latte or some other pumpkin-related beverage. Well, I was sick of my pumpkin addiction burning a hole in my wallet, so I decided to create my own Pumpkin Spice Simple Syrup to use in coffee (or any beverage really). With this recipe, I’ve managed to take back my pumpkin pride and my fall-inspired beverages are that much more thankful for it! It’s taken me some time to get this very simple pumpkin spice syrup recipe right, but I’ve finally worked out the kinks. The best part for me is that it isn’t cloyingly sweet like many syrups. It has all of the flavor, but it is well balanced with the sweetness. The biggest issue I found was figuring out what to do about all of the solids that build up in the syrup. Many recipes out there just leave you to deal with the leftover spice particles that never quite fully dissolve in your beverages. I decided to make my usual recipe, but this time I strained the pumpkin spice simple syrup through cheesecloth to get a lighter syrup that is still extremely tasty, but that doesn’t have any of the solids. I used it in iced coffee and it dissolved almost instantly while leaving no solids on the bottom of the glass! One more thing to note is that the usual, natural color of a homemade pumpkin spice syrup is a muddy brown color, which makes sense because of all the spices, so don’t be alarmed. 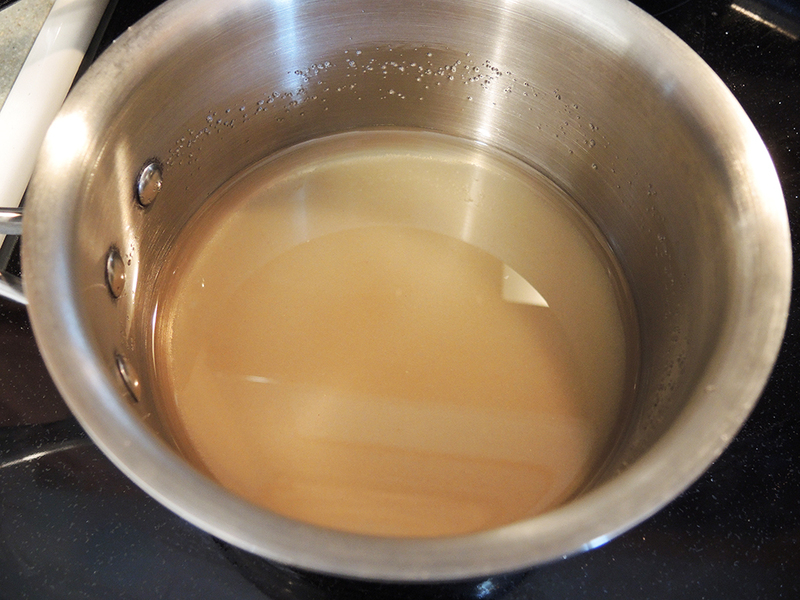 When or if you strain the mixture, it will get lighter, but still remain pretty brown and cloudy. If you happen to see pictures online of bright orange pumpkin syrup, it’s either artificially colored or just a photoshop lie, so don’t get discouraged! Enjoy! Makes approximately 1/2 cup at 400 calories total or about 17 calories per teaspoon. Set the stove heat to medium. Stir a 1/2 cup of sugar and 1/2 cup of water in a small sauce pan over the heat. 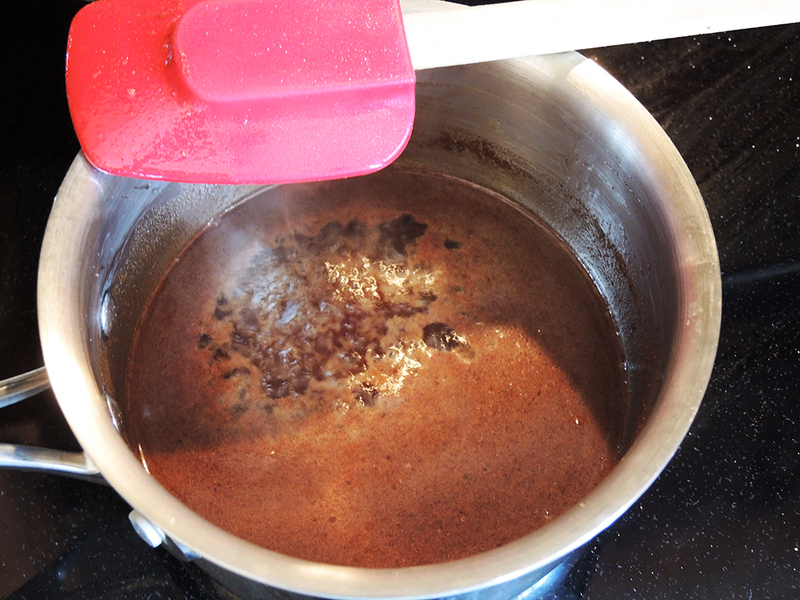 Stir frequently to make sure the sugar dissolves and doesn’t burn on the bottom of the pan. Once the ingredients start to simmer, give the contents a good stir before adding in all of the spices, but not the pumpkin. Bring the contents of the pot back up to a low simmer while stirring frequently. 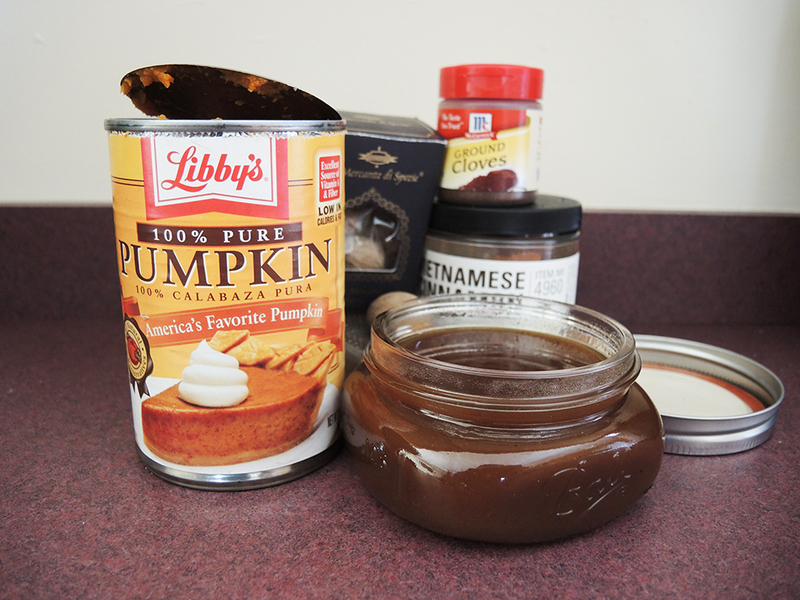 When the syrup is simmering, add in the pumpkin and stir all of the ingredients together very well. Bring the syrup up to a simmer again while stirring every 30 seconds or so. Lower the stove temperature to medium low and let everything simmer for about 10 minutes to reduce. Make sure to stir every minute or so to make sure that nothing sticks or burns. Scrape down the sides of the sauce pan as well so that nothing burns on the edges. 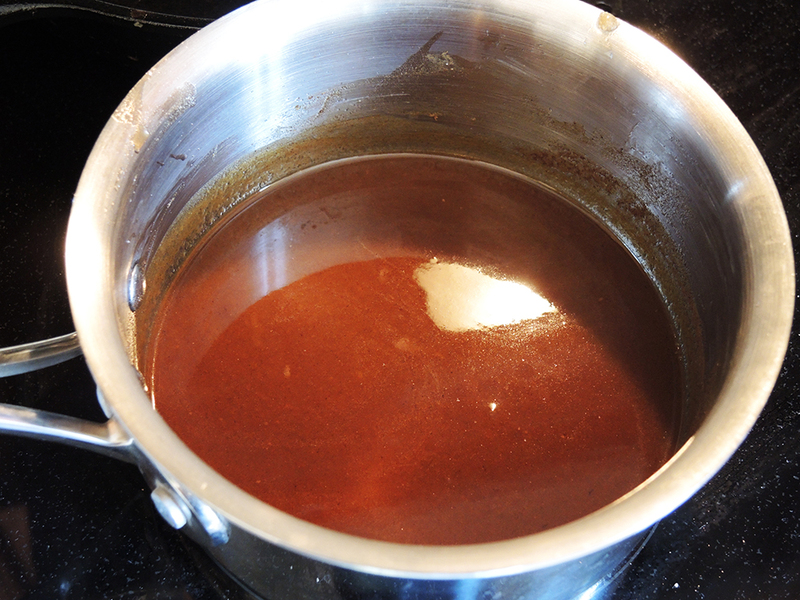 After 10 minutes, remove the syrup from the heat and let it cool for a few minutes. At this point the syrup is ready to use. This unstained and unfiltered syrup is delicious, but it’s also full of sediment. This kind of syrup would be great as a dessert topper, but it is less ideal for drinks because it just won’t dissolve fully. Nonetheless, it is packed with concentrated flavor. If you like it this way, then just bottle it up for later use. If you want to strain the syrup so that it is ideal for hot or cold beverages, take the time while it cools to get your cheesecloth or fine mesh strainer ready by placing it over a glass measuring cup or other heat-resistant container. A rubber band or some string will hold the cheesecloth in place. If you are using cheesecloth though, just two layers should be enough. When I overdid it with the layers, it was very hard to get the syrup through. 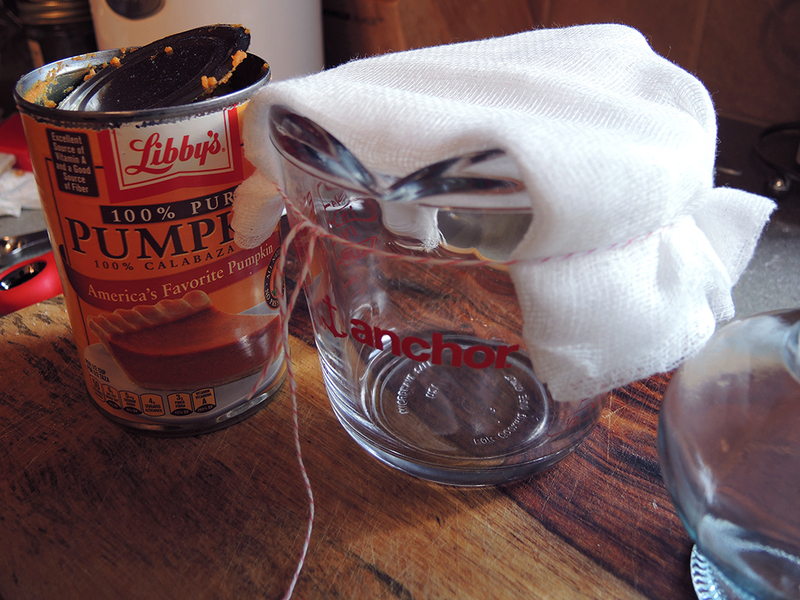 When you are ready and the syrup is still a bit warm, start pouring it through the cheese cloth or mesh strainer. You may need to use a spoon to press the syrup through because it should be relatively thick. 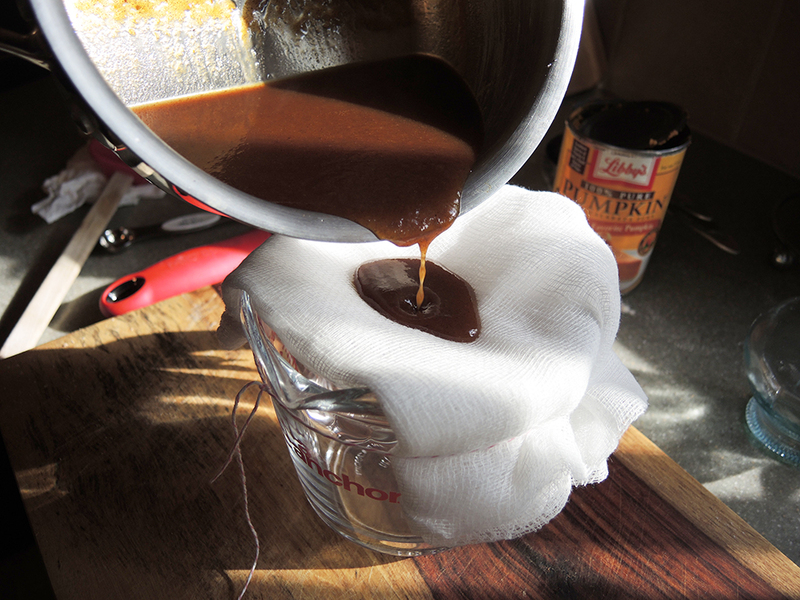 If you aren’t having much luck with the cheesecloth, an alternative method is to pour all of the syrup into the center of the cloth, grab the edges and fold them up so that you’ve created a little pouch containing the syrup. Twist the top shut and squeeze the syrup by applying pressure to the cloth. This can get a little messy, but you will definitely get all of the syrup out while leaving behind the solids. If you try this alternative method, just make sure the syrup isn’t too hot, so you can handle it easily. 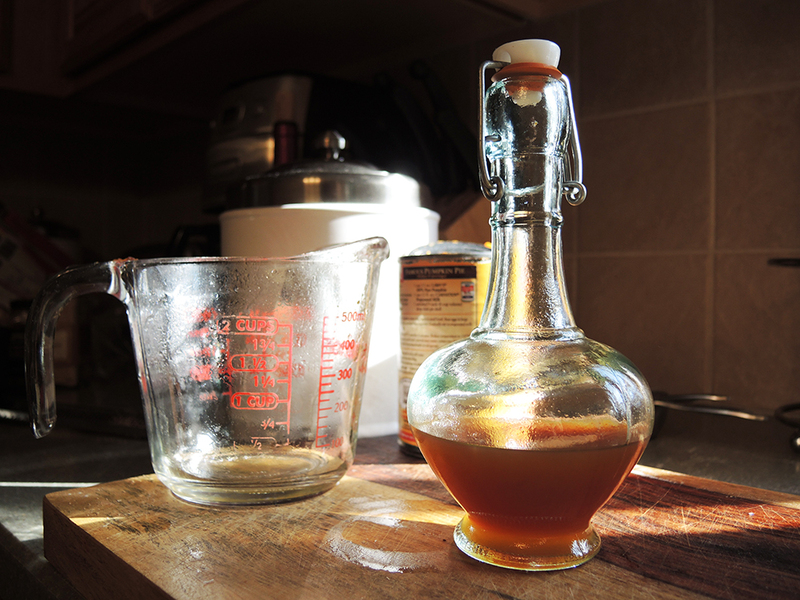 Once strained, get rid of the solids and transfer the filtered syrup to an airtight glass container. Place the syrup in the fridge to cool and thicken even more. When it’s cool, it’s ready to use in hot or even cold beverages. 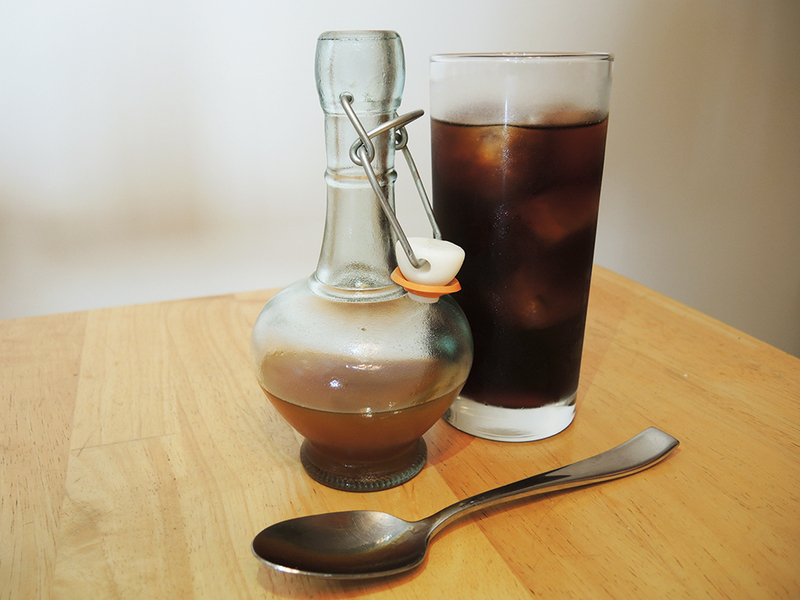 I used it in some homemade cold-brewed iced coffee and just a couple of teaspoons went a long way to adding in some delicious pumpkin spice flavor. looks delicious. I think I will double the amount to have it for all sorts of things. I hope it does not spoil. It should last a long time as long as it is kept in the fridge. I can’t really say how long, but you should be fine for at least the fall season! Great method. I have never tasted pumpkin spice. Not so common in my part of the world. Wow. I forget how pumpkin-centric the U.S. is compared to the rest of the world sometimes. I guess if I had to describe it, imagine the spices of an apple pie, but without the apples and with a mild flavor of something like a squash crossed with a sweet potato. Ha! That may not sound appealing, but it’s delicious! I think I can work it out. I imagine it to be pretty tasty indeed. Very nice…you know, Starbucks actually has no real pumpkin in it? Good for you! That does not surprise me! Ha!